Enough with spring training already. Leave us get to the games that count, which starts Monday at Yankee Stadium with a rematch of last year’s American League wild card game opponents. The Yankees only hope the outcome will be different from the 3-0 setback they suffered last October against the Astros and modern-day Yankees killer Dallas Keuchel, the 2015 AL Cy Young Award winner. For the 114th home opener in franchise history, the Yankees will open all gates and security check points at 11 a.m. Monday and strongly encourage ticketed fans to arrive early to avoid long lines and to enjoy the pre-game programming. With crowds and security lines expected to increase closer to the 1:05 p.m. game time with Masahiro Tanaka on the mound, the Yankees recommend that ticketed fans arrive early and pre-register online to be eligible for expedited security checks that are available at Gate 2 and the Suite Entrance. In accordance with a Major League Baseball mandate, additional enhanced security measures will be in place at all gates at the Stadium, and for the second year, the Yankees will offer expedited-access entry points through a partnership with CLEAR. Those registered in advance will be able to utilize Fast Access entryways for the quickest available entry into the building. In order to participate, fans must pre-register at https://sports.clearme.com/yankees. The Yankee Stadium CLEAR service is free. Fans are invited to visit Monument Park, located in center field, and tour the New York Yankees Museum, presented by Bank of America. Each experience will open at 11 a.m. Monument Park remains accessible until 45 minutes prior to the scheduled game start time subject to capacity limitations. Please note the line to Monument Park may close earlier than the Park itself. The Museum is located adjacent to Section 210 on the Main Level and tells baseball’s and the Yankees’ storied history through exhibits of historic artifacts. Admission is free for all ticketed guests. Current exhibits include: Five Great Teams: The 1927, 1939, 1961, 1977, and 1998 New York Yankees; Pinstripes in Bronze: Celebrating Monument Park’s Newest Honorees; The Skipper: Celebrating Joe Torre, Hall of Fame manager; and New Era Exhibit. Fans may also watch the scheduled batting practice, which is scheduled to be ongoing throughout the early afternoon and ends at approximately 12:20 p.m. The official pre-game ceremony will begin at approximately12:30 p.m. with the introduction of both teams on the baselines. As part of the Opening Day festivities, former Yankees outfielder Hideki Matsui, the 2009 World Series Most Valuable Player, will throw out the ceremonial first pitch. He will also be honored with the Pride of the Yankees Award at the 37th annual Homecoming Dinner following the game. Matsui played seven seasons with the Yankees (2003-2009) and batted .292 with 140 home runs, 597 RBI and a .370 on-base percentage in 916 games and 3,348 at-bats. He played in two World Series (2003 and ’09) with the club, winning a championship in 2009 and was named MVP for hitting .615 with one double, three homers and eight RBI in 13 at-bats. Matsui also played three additional major league seasons with the Angels (2010), Athletics (2011) and Rays (2012). All those in attendance will also receive a Yankees magnetic schedule courtesy of AT&T. Following Opening Day, the Yankees will play two additional games against Houston at 7:05 p.m. Wednesday and 4:05 p.m. Thursday. Ticket specials will run Wednesday (MasterCard $5/Military Personnel/Student Game) and Thursday (Military Personnel/Senior Citizen/Youth Game). The Yankees recently announced the availability of mobile ticketing for the 2016 season. In addition to traditional hard stock paper tickets, the Yanks will offer fans the opportunity to receive mobile tickets on a fan’s Smartphone. Print-at-home paper tickets (PDFs) have been discontinued to further combat fraud and counterfeiting of tickets associated with print-at-home paper tickets (PDFs). For more information on mobile ticketing, visit http://www.yankees.com/mobile. As part of MLB’s initiative to standardize security procedures at all 30 parks, ticket holders are required to be screened via metal detectors before entering Yankee Stadium. This procedure is a result of MLB’s continuing work with the Department of Homeland Security and is in addition to the bag-check policy in place throughout the league. Metal detectors are located at all Stadium gates. Once ticket holders have been screened and have had their MLB-compliant bag and small personal handbag checked, they will have their tickets scanned. All Stadium gates are fully staffed and available for entry two hours prior to the game’s scheduled start time. For security reasons, each ticket holders is permitted to bring into the Stadium only one MLB-compliant bag — presently defined by MLB as soft-sided and no larger than 16 inches by 16 inches by 8 inches — and only one smaller-sized soft-sided personal item (e.g., a handbag, clutch, tote or plastic grocery bag). All hard-sided bags and containers are strictly prohibited. All bags, personal items and their contents will be visually inspected before they are permitted into the Stadium. Bag-size bins will be used at entry inspection points to confirm the size of all bags and personal items, which must fit without assistance, modification or adjustment. There is no storage area for any items. To enable ticket holders to enter the Stadium in a more timely manner, the Yankees encourage them to remain aware of and comply with the bag policy, as well as consider carrying as little as possible. Please note security regulations may be amended at any time. Pursuant to MLB requirements, all ticket holders, including children, must be screened. Infants and toddlers may be carried through the metal detectors; those children who are able to walk may be asked to walk through on their own. Those Guests who choose not to or who are unable to go through a walk-through metal detector have the option of being manually checked with a hand-held metal detector or a physical pat-down. If a walk-through metal detector alerts a security officer to the presence of items that require further inspection, ticket holders will be directed to the side, where they will be screened via a hand-held metal detector or physical pat-down. When the items in question are discovered, fans will be asked to display them and/or allow a security officer to examine them. At this time, a security officer will determine whether or not these items will be permitted in Yankee Stadium. Please note that the list of prohibited items at the Stadium includes (but is not limited to) laptops, firearms, knives or weapons of any kind, laser pens, glass, cans or aluminum bottles or thermoses, selfie-sticks, video cameras or other equipment designed for the sole purpose of video and/or audio recording, and hard-sided bags, such as briefcases. Please also note that there is no storage area for prohibited items. Ticket holders arriving by public transportation should take particular care not to bring any prohibited items, as no exceptions will be made. For a full list of prohibited items, please visit http://www.yankees.com and click on the Yankee Stadium tab at the top of the page. What the Yankees needed on Andy Pettitte Day Sunday at Yankee Stadium was, well, Andy Pettitte. 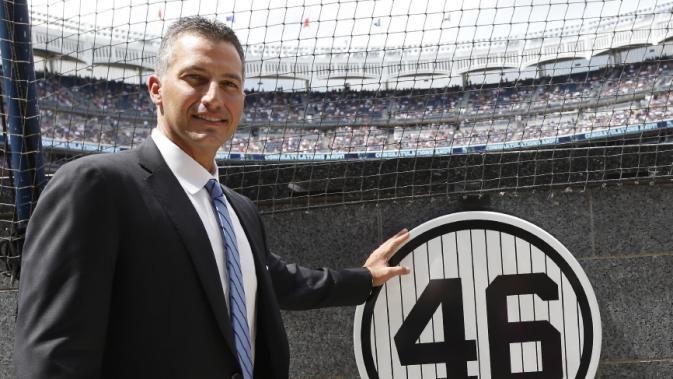 Another nostalgic ceremony to retire Pettitte’s No. 46 and install a plaque in Monument Park honoring his pitching career with the Yankees was barely over when CC Sabathia gave up a two-run home run to Indians first baseman Carlos Santana in the first inning in what turned out an ominous day for the big lefthander. There was no one warming up in the bullpen in the third inning when Sabathia had to come out of the game because of an injury to his surgical right knee. Yankees manager Joe Girardi had to rely on a couple of Scranton shuttle guys, Nick Rumbelow and Branden Pinder, to get through the middle innings. A chant of “Andy Pettitte” from the bleachers sprung up several times from fans with fond memories of his grim determination on the mound over an 18-season major league career, all but three of them with the Yankees, that included an additional 276 1/3 innings of postseason work that produced a 19-11 record and four World Series championships. The Yankees had coaxed Pettitte out of retirement once before, in 2012. Too bad they could not do it again Sunday. The only work for Pettitte Sunday was getting through a well-constructed speech in which he thanked his family, former teammates, the Steinbrenner family and even us writers, whom he said treated him fairly over the years. Joining him on the field for the pregame ceremony were fellow Core Four partners Mariano Rivera, Derek Jeter and Saturday’s honoree Jorge Posada as well as other former teammates Bernie Williams, Paul O’Neill, David Cone, Scott Brosius, Tino Martinez and Hideki Matsui; former trainer Gene Monahan; former executive Gene Michael; Hall of Famers Reggie Jackson and former manager Joe Torre; managing general partner Hal Steinbrenner and vice president Jennifer Steinbrenner Swindal. Sabathia was supposed to be Pettitte’s successor as the senior voice on the pitching staff, but he has been slowed down by a knee that has been operated on twice and which was drained twice over the past two months. Sabathia admitted to Girardi that he felt discomfort while warming up but did not say anything until he was interrogated by his manager on the mound. Sabathia, who was to undergo an MRI exam late Sunday, has not been himself most of the season. He is 4-9 with a 5.27 ERA, and his record could be worse if the Yankees had not come back from trailing in games to get him off the hook eight times, including Sunday when they tied the score in the seventh inning on a two-run double by Carlos Beltran. A comeback victory was not forthcoming, however, as Francisco Lindor finished off his second straight three-hit game with a solo home run off Dellin Betances in the eighth inning that held up for a 4-3 victory for the Indians, who were 5-2 against the Yankees this year. It was almost as painful a game for the Stadium crowd of 46,945 to watch as it was for Sabathia. This was an absolute walkathon with Yankees pitchers combining for 10 walks (four by Sabathia) and the Indians for six. Despite all those free base runners the Yankees allowed, the score stayed close because the Tribe was 1-for-10 (.100) with runners in scoring position and left 11 on base, which would have been more if the Yanks had not turned four double plays. Sabathia’s injury, which general manager Brian Cashman said would likely put him on the 15-day disabled list, botches plans the Yankees had of going to a six-man rotation with the return from the DL of Michael Pineda, who is scheduled to start Wednesday at the Stadium against the Astros. The idea was to give an additional day of rest to all the starters, but that will have to go on hold for now. The Yankees could return Adam Warren to the rotation, but as well as he has pitched in relief they are reluctant to do that. The more likely choice for a sixth starter would be Bryan Mitchell, who was on the seven-day concussion list after being struck in the face by a batted ball Aug. 17. Cashman said Mitchell may pitch a simulated game this week. All these pitching woes and the possibility the Yankees could drop out of first place put a damper on the special day for Pettitte, who might have been a big help had he been able to don a unifiorm. A FIVE-TIME WORLD CHAMPION AND THREE-TIME ALL-STAR, PETTITTE WAS A MODEL OF CONSISTENCY IN THE YANKEES ROTATION FOR 15 SEASONS, GOING 219-127 (.633) AND TYING THE FRANCHISE RECORD OF 438 STARTS. THE CLINCHING GAME IN EACH OF THREE SERIES IN A SINGLE POSTSEASON. THE LEFTHANDER RETIRED WITH THE THIRD HIGHEST WIN TOTAL IN FRANCHISE HISTORY, AND HE IS THE CLUB’S ALL-TIME STRIKEOUT LEADER, WITH 2,020. TWICE A 20-GAME WINNER, PETTITTE FINISHED HIS CAREER AS THE FIRST PLAYER TO PITCH MORE THAN 15 SEASONS IN THE MAJORS WITHOUT EVER HAVING A LOSING RECORD. During Saturday’s ceremony at Yankee Stadium for former All-Star catcher Jorge Posada, whose uniform No. 20 was retired and who received a plaque in Monument Park, I got a text from my son Corey, who was watching on television from his home on Long Island. Corey is only 33. If he thought he felt old, how about me? I met Posada at his first spring training camp with the Yankees 20 years ago. There is a photo in the office of my Queens apartment of me presenting the James P. Dawson Award to Posada as the outstanding rookie in training camp for 1997 before a spring training game at Tampa, the year before there was a major league franchise in that area. And now there was Posada, still trim but his wavy black hair turning grey, standing behind a podium surrounded by former teammates, Yankees dignitaries and his family drinking in praise from a sellout crowd in the Bronx talking about a career that does not seem all that long ago. One of the feelings that these celebrations at the Stadium convey is the passage of time. Posada was an integral part of a period in Yankees history that was indeed glorious and to people of Corey’s generation a dominant part of their personal scrapbook, the way previous generations venerated the careers of Babe Ruth, Lou Gehrig, Joe DiMaggio, Yogi Berra, Whitey Ford, Mickey Mantle, Bobby Murcer, Thurman Munson, Ron Guidry and Don Mattingly. His partners in the Core Four — Derek Jeter, Mariano Rivera and Andy Pettitte, who will be honored Sunday — were in attendance as well as former teammates Bernie Williams, David Cone, Hideki Matsui and Paul O’Neill; former manager Joe Torre; former trainer Gene Monahan; former player, coach, manager and executive Gene Michael and general partner Jennifer Steinbrenner Swindal. 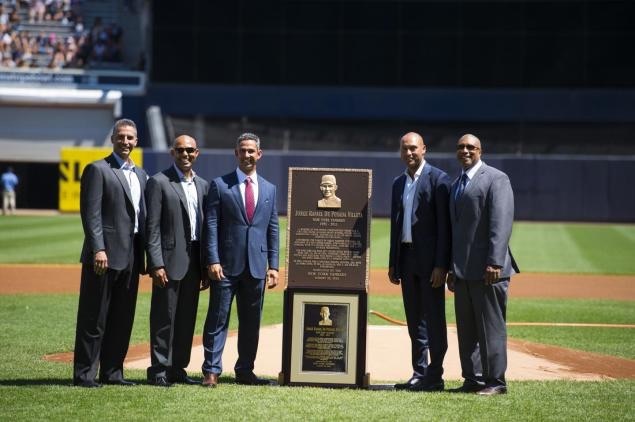 Andy Pettitte, Mariano Rivera, Jorge Posada, Derek Jeter, Bernie Williams (NY Daily News photo). Posada was truly moved at being considered part of the legacy of great Yankees catchers that began with Bill Dickey and continued through Berra, Elston Howard and Munson, whose widow, Diane, was also on the field. Posada kept a baseball card of Munson in his locker throughout his playing career. Berra, hobbled by painful knees, was unable to attend but sent Posada a personal message that was displayed and narrated on the video board in center field. Posada could not help but appreciate the irony that he had resisted at first the Yankees’ suggestion that he convert to catcher from second base, his natural position, while in the minor leagues in 1991. He recalled a conversation he had with Mark Newman, then the Yankees’ director of player personnel. Posada went on to play 17 seasons behind the plate, all for the Yankees, and batted .273 with 275 home runs and 1,065 RBI. He was a five-time All-Star, won five Silver Slugger Awards and wore four World Series rings. Only twice did the Yankees fail to reach postseason play in Posada’s time. He played in 125 postseason games, including 29 in the World Series. That was a break for all of us, no matter how old it made us feel Saturday. A MEMBER OF FIVE WORLD CHAMPIONSHIP TEAMS AND A FIVE-TIME SILVER SLUGGER AWARD- WINNER, POSADA WAS A HOMEGROWN YANKEE, PLAYING ALL 17 OF HIS MAJOR LEAGUE SEASONS IN PINSTRIPES. CONTINUING THE LEGACY OF GREAT YANKEES CATCHERS, HE APPEARED IN 1,829 CAREER GAMES, COMPILING A .273 BATTING AVERAGE, WITH 275 CAREER HOME RUNS, 1,065 RBI, AND A .374 ON-BASE PERCENTAGE. THE FIVE-TIME ALL-STAR SET CAREER HIGHS WITH 30 HOME RUNS AND 101 RBI IN 2003, FINISHING THIRD IN AL MVP VOTING AND MATCHING YOGI BERRA’S SINGLE-SEASON RECORD FOR MOST HOME RUNS BY A YANKEES CATCHER. IN 2007, POSADA HAD A HISTORIC SEASON, BATTING .338, WITH 20 HOME RUNS, 90 RBI, 42 DOUBLES, AND A .426 ON-BASE PERCENTAGE. The Yankees will return home Friday night for the first of six games at Yankee Stadium. The stretch will feature a three-game series against the Mets (Friday-Sunday, April 24-26) and a three-game set against the Rays (Monday-Wednesday, April 27-29). As part of his retirement celebration, Bernie Williams will throw out the ceremonial first pitch prior to Friday’s 7:05 p.m. game vs. the Mets. Additionally, the Hard Rock Cafe will debut a souvenir pin that honors Williams in a pregame ceremony. Fifteen percent of pin proceeds will go to Hillside Food Outreach (www.hillsidefoodoutreach.org). Prior to Sunday’s 8:05 p.m. game vs. the Mets, Matthew Morrison will sing the national anthem. The Tony, Emmy and Golden Globe-nominated actor is currently starring in the Harvey Weinstein musical Finding Neverland and recently wrapped up the final season of Fox’s musical comedy Glee where he starred as Will Schuester. Ticket specials will run Saturday, April 25 (Youth Game), Monday, April 27 (MasterCard $5 and Military Personnel Game), Tuesday, April 28 (MasterCard $5, Military Personnel and Senior Citizen Game) and Wednesday, April 29 (MasterCard Half-Price, Military Personnel, Senior Citizen and Student Game). Saturday, April 25 – Yankees vs. Mets, 4:05 p.m.
Brett Gardner Replica Bat Day, presented by Bank of America, to first 10,000 Guests, 14 and younger. Tuesday, April 28 – Yankees vs. Rays, 7:05 p.m.
Masahiro Tanaka Bobblehead Night, presented by AT&T, to first 18,000 Guests. Tickets may be purchased online at http://www.yankees.com, http://www.yankeesbeisbol.com, at the Yankee Stadium Ticket Office, via Ticketmaster phone at (877) 469-9849, Ticketmaster TTY at (800) 943-4327 and at all Ticket Offices located within Yankees Clubhouse Shops. Tickets may also be purchased on Yankees Ticket Exchange at http://www.yankees.com/yte, the only official online resale marketplace for Yankees fans to purchase and resell tickets to Yankees games. Fans with questions may call (212) YANKEES [926-5337] or email tickets@yankees.com. As part of Major League Baseball’s initiative to standardize security procedures at all 30 parks, visitors are required to be screened via metal detectors before entering the Stadium. The increased security measures are the result of MLB’s continuing work with the Department of Homeland Security and are designed to elevate and standardize security practices across the game. The added security measures are in addition to bag checks that are conducted at all MLB ballparks. As a result, the Yankees strongly encourage all visitors to budget extra time for arrival and entry to the Stadium for all home games throughout the 2015 season and future seasons. Gerald Williams, Cal Ripken Jr., Dave Winfield, Michael Jordan, Derek Jeter. Derek Jeter saved the best for last. Another ceremony at Yankee Stadium, this one to commemorate the 20-year career of the shortstop who now holds many of the legendary franchise’s records, was drawing to a close. Perfect. Sure, it was nice to have his parents, his grandmother, his sister, his nephew and a slew of old teammates and pals on the field to celebrate his impending retirement. But the actual fact will not occur until the last game of the 2014 season. The Yanks had a game Sunday afternoon against a Royals team they are competing against for a post-season berth, and Jeter was in the lineup. Torre was among those closest to Jeter back at the Stadium for the ceremonies, along with former teammates Paul O’Neill, Tino Martinez, Mariano Rivera, David Cone, Bernie Williams, Gerald Williams, Jorge Posada, Hideki Matsui and Tim Raines; Hall of Famer Reggie Jackson; former trainer Gene Monahan; MLB Network broadcaster and former infielder Harold Reynolds and commissioner-elect Rob Manfred. The Yankees had a few surprises for DJ by trotting out Hall of Famers Cal Ripken Jr. and Dave Winfield and hoops legend Michael Jordan. The Steinbrenner family presented several gifts, including a Waterford Crystal tower with Jeter’s No. 2 atop it and a check for $222,222.22 donated to his Turn2 Foundation. 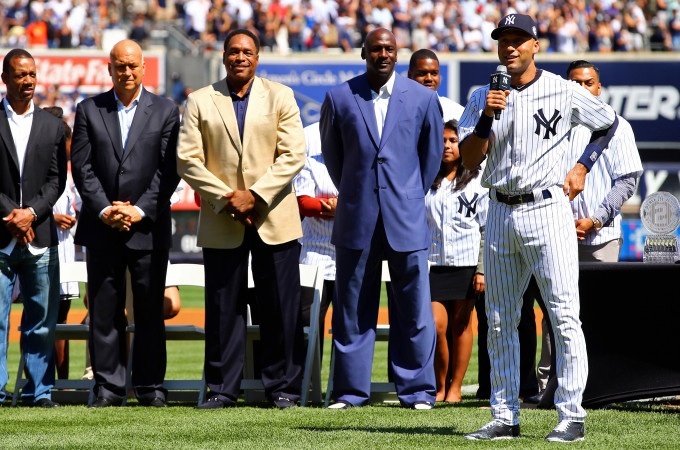 “It’s hard to believe 20 seasons have gone by so quickly,” Jeter said to the sellout crowd. “I want to take a brief moment to thank the Steinbrenner family and Mr. George Steinbrenner for giving me the opportunity to play my entire career with the only organization I wanted to play for. “I thank my family and friends for all their support through the good times and more importantly through the tough times. All my managers, coaches, trainers and teammates current and former, I have been blessed to play with the best. I would not want to compete without you guys. Not much syrup, all on the mark and to the point. This is the Jeter all of us have watched and heard for two decades. What began Sunday was not just the passing of 20 years but that of an era. The Yankees’ most recent dynastic run of championships started in 1996, Jeter’s rookie season. What is harder to believe is that one of these days he will be in one of those seats for guests at Yankee Stadium events. Throughout all those World Series triumphs from 1996 through 2009 and up to today Jeter has been the constant thread. Sunday was chosen by the Yankees to celebrate that career, but as Jeter plainly put it that career is not over yet. As team captain, Jeter is the first to break from the dugout onto the field at the start of home games. He went into his similar trot Sunday, but when he reached his customary position at shortstop and turned around he noticed that he was the only player on the field. 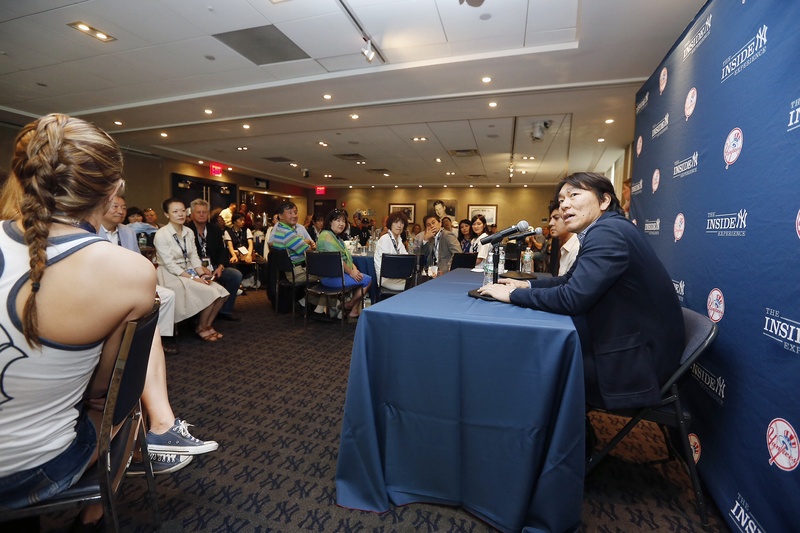 Hideki Matsui participated in the Inside Experience Friday, a program designed to provide fans with the opportunity to connect with a current or former Yankees player or executive. Along with the meet and greet, Inside Experience attendees are also able to take a photo with the Yankees’ 2009 World Series trophy, go on a tour of Yankee Stadium, attend batting practice, and receive a ticket to that night’s game. For more information on the Inside Experience program, visit http://www.yankees.com/theinsideexperience. Funny thing about the Yankees’ Old-Timers’ Day is that the event itself never gets old. Other organizations that followed the Yankees’ lead over the years in staging reunions of their old players discontinued the practice except for special occasions. With the Yankees, however, the exercise remains an annual event, and each year it seems something new is added. This year’s 68th annual gathering marked a return for the first time of favorites such as Hideki Matsui and Johnny Damon, key stars of the franchise’s last World Series championship of 2009. Another new returning alumni was John “The Count” Montefusco, a former National League Rookie of the Year with the Giants who became part of the Yankees’ rotation in the 1980s. One of the great things about new blood joining the exercise is that new old timers like Matsui and Damon are still agile enough to play in the three-inning game. Matsui hit a home run this year in the Hall of Fame Classic last month and after watching him swat a few into the stands during batting practice I thought he might pop one during the game but no such luck. Matsui even pitched to one batter, a Hall of Famer no less, and gave up a single to Reggie Jackson. Meanwhile, there were pitchers all over the field. David Cone played some third base. So did “El Duque,” Orlando Hernandez. David Wells made a sparking scoop of a short-hopper at first base. Coney had a tough day on the mound. He gave up a home run to Jesse Barfield and a hit to his old running mate, Wells. Hall of Famer Rickey Henderson told me during batting practice that he has been bothered by a sore toe. He said he went to the doctor thinking it was broken, but that x-rays were negative. Actually, stolen bases are frowned upon in the Old-Timers’ game. In the first inning, Henderson drove a liner to left-center and sore toe and all legged out a double. 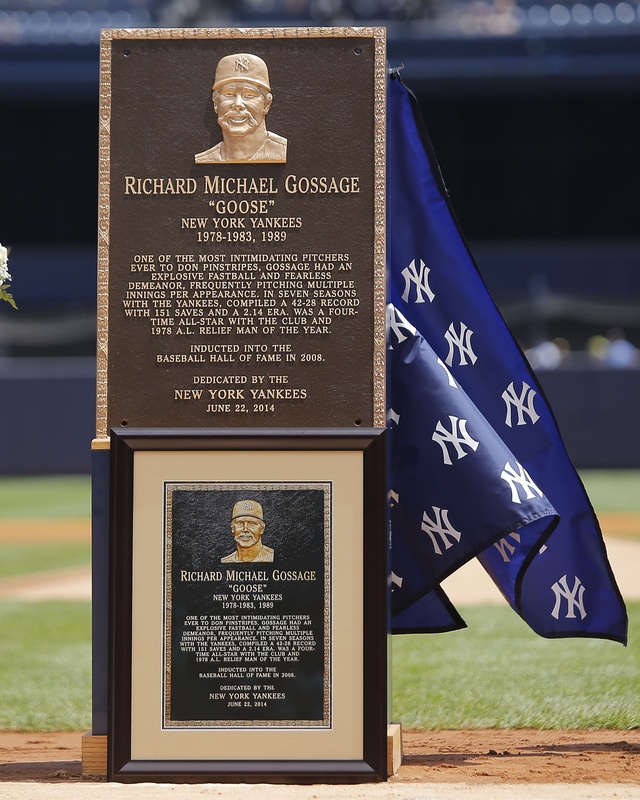 A special treat in this year’s event Sunday was the dedication of a plaque in Monument Park for Hall of Fame relief pitcher Rich “Goose” Gossage, the day after first baseman Tino Martinez was installed. EVER TO DON PINSTRIPES, GOSSAGE HAD AN EXPLOSIVE FASTBALL AND FEARLESS DEMEANOR, FREQUENTLY PITCHING MULTIPLE INNINGS PER APPEARANCE. IN SEVEN SEASONS WITH THE YANKEES, COMPILED A 42-28 RECORD WITH 151 SAVES AND A 2.14 ERA. WAS A FOUR-TIME ALL-STAR WITH THE CLUB AND 1978 A.L. RELIEF MAN OF THE YEAR. INDUCTED INTO THE BASEBALL HALL OF FAME IN 2008. Gossage reminisced that Old-Timers’ Day was always his favorite day of the year. He grew up in Colorado Springs with a father who was a huge Yankees fan. Goose followed the career of Mickey Mantle closely and got to see his hero at the first Old-Timers’ Day he attended while a visiting player. When he came to the Yankees in 1978, he made sure to circle that day on the calendar. So it was fitting that Old-Timers’ Day was the venue for Goose’s entrance into Yankees immortality.